For 43 years, Don Clayberg has been celebrating the Fourth of July at DeKalb’s Hopkins Park playing games, grilling food and enjoying friends and family. The Sycamore resident loves the annual tradition that brings families from all over DeKalb County together to celebrate the holiday with food, fun and fireworks. “We really have fun. I like all the people here,” Clayberg said. “We get here at 7 a.m. to get our spot. It’s the same spot every year and it’s the best spot in the park. It has shade and a perfect view for the fireworks. The smell of burgers and brats was in the air at Hopkins as hundreds of people gathered to enjoy the afternoon that culminated with a performance by the DeKalb Municipal Band and accompanying fireworks show. Scott deOliveira, marketing and community manager for the DeKalb Park District, which sponsors the event, said the band and fireworks show is a long-standing DeKalb tradition for many families. “It’s a great park to celebrate a holiday, and just a fun day for everybody. Hopkins is a great backdrop for music and fireworks,” he said. New to the event was a flyover by a B-17 airplane just before the fireworks show began. The vintage plane, which is one of only a few left in America, is temporarily being housed at DeKalb Taylor Municipal Airport. Also making its debut this year was a 5K run, which began and ended at Hopkins. Rachel Schmit, recreation supervisor for the DeKalb Park District, said she was surprised at how many people participated in the early-morning run. She said about 60 to 70 people ran in the race. Steve LeVrouw has been coming to the park for more than 40 years and said celebrating at Hopkins has been a tradition for him and his family. He said they eat “a lot” before the fireworks show. Julie Sgarlata, 55, of Sycamore has been enjoying the holiday at Hopkins since she was 12 years old. She said that while things have changed throughout the years, she still has fun with her family and friends. Ashley Perkins, 30, was busy grilling ribs and chicken while her children played in the park. This is only the second time she’s come to Hopkins for the holiday, but said she loves it. The Melendez family came all the way from Plano to celebrate. Vanessa Melendez, 19, said her entire family has been coming to Hopkins for about five years to enjoy the holiday. 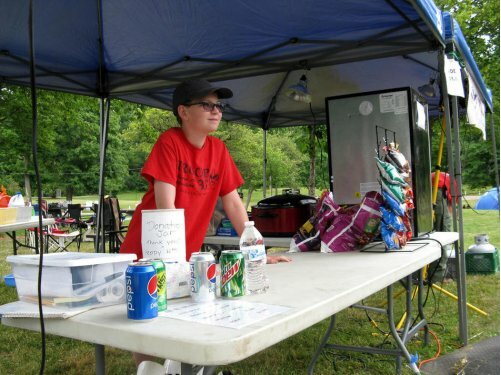 Boy Scouts from Troop 33 in DeKalb were getting ready to sell hot dogs and hamburgers, which is something the troop has done for more than 20 years. All the money the Scouts earn helps pay for troop activities. Reilly Farrell, 12, was working at the booth. The seventh-grader at St. Mary’s in DeKalb said he’s been coming to Hopkins for many years. “I like the fireworks the best because they’re loud and they look cool,” he said. For Pat Deiss and her family, the holiday gathering is a bittersweet celebration. Her mother’s birthday is July 4, and the DeKalb resident remembers her late mother by spending the day with family at Hopkins Park. “This is a perfect place. Everyone is so nice and friendly,” she said. “Families can come here and feel safe. I love the band, they sound great.